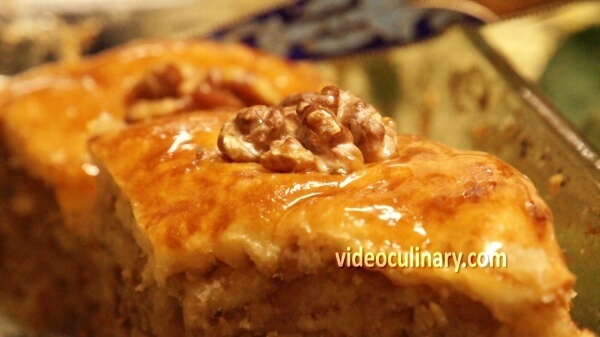 This recipe offers a popular central Asian variation on baklava. 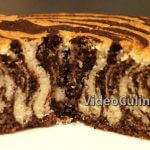 Layers of enriched yeast dough filled with nuts and sweetened with honey syrup. 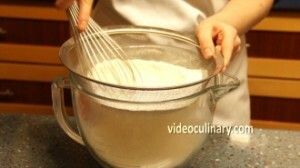 Make the dough: Sift 500 grams (17.6 oz) of flour into the mixing bowl. 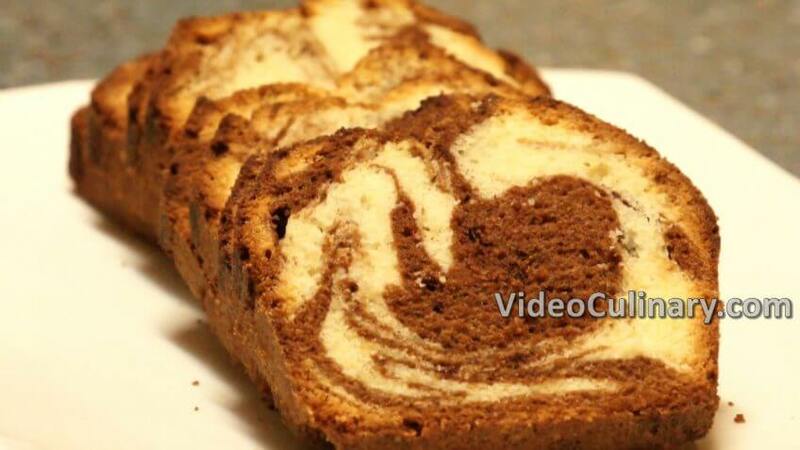 Add 1 teaspoon of salt, 2 teaspoons of sugar and 1 ½-teaspoon dry yeast. Mix on low speed with the hook attachment, add 2 eggs, 250 ml (6.8 fl oz) of milk add 100 grams (3.5 oz) of pliable butter and mix for 8 minutes. Cover with plastic wrap and allow the dough to rise, for an hour at room temperature. 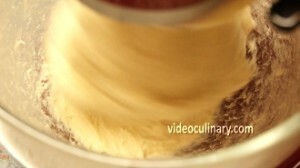 Spread the dough onto the floured working surface. 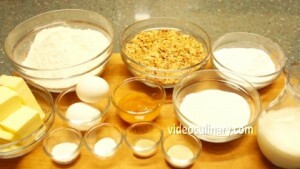 Take one third of each side and fold it towards the center, brushing away any raw flour. Folding the dough will even out its temperature, degas it and increase its strength. Place the dough back into the bowl, seam side down, cover with plastic wrap and allow the dough to rise at room temperature for one hour. Make the filling: combine 400 grams (14 oz) of chopped toasted walnuts, 200 grams (7 oz) of sugar and ½ a teaspoon of cardamom. Spread the dough onto the working surface. Divide into 10 parts, making 2 of them slightly bigger for the top and the bottom layers. Preshape each piece into a round. Keep the dough covered as you roll it, to prevent drying. 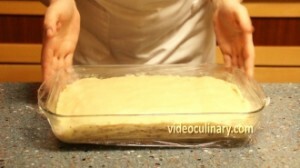 Roll the larger piece first, and transfer to a 20X30 cm (8×12 inch) oiled baking pan. 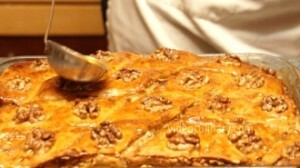 Brush with melted butter, sprinkle a thin layer of the walnuts mixture, and lay another sheet of dough. Repeat with the rest of the layers. 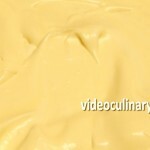 You will need a total of 250 grams (8.8 oz) of melted butter. Cover with plastic wrap and proof for 30 minutes. Brush the top layer with an egg yolk. 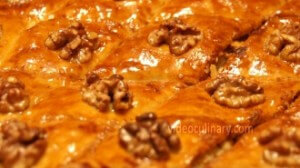 Using a sharp knife, score the baklava into diamonds of 4-5 cm (1 ½-2 inch). Garnish each diamond with a halved walnut. Bake at 200°C (400°F) for 20 minutes. 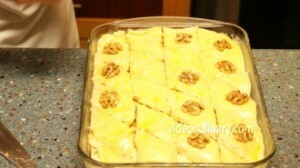 Remove from the oven, and pour the remaining melted butter over the baklava. 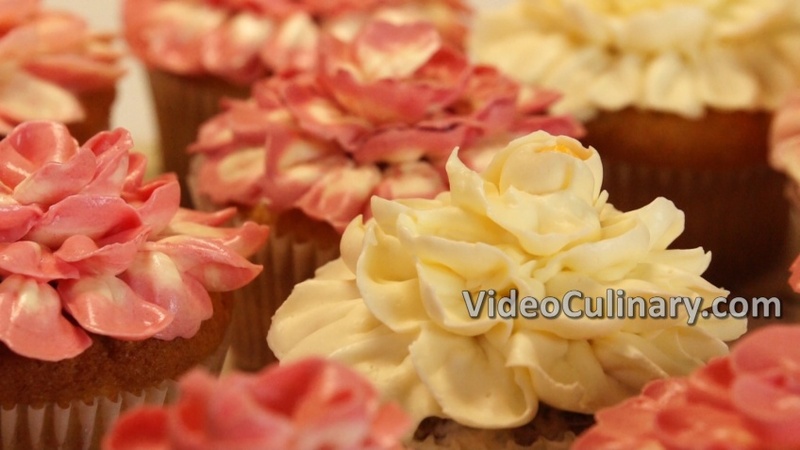 Lower the oven temperature to 180°Celsius (350°F) and bake for 35-40 minutes more. Make the simple syrup while the baklava is baking. 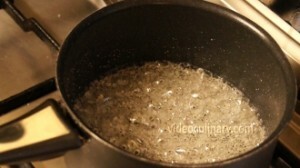 Combine 200 grams (7 fl oz) of sugar with 200 ml (6.8 fl oz) of water in a saucepan. Bring to a boil and simmer for 10 minutes. Remove from the heat, add 100 grams (3.5 oz) of honey and stir. 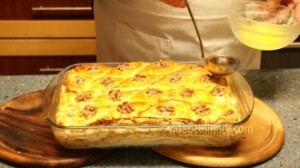 A skewer inserted in the baklava should come out clean. Pour the honey syrup over the baklava and cool. 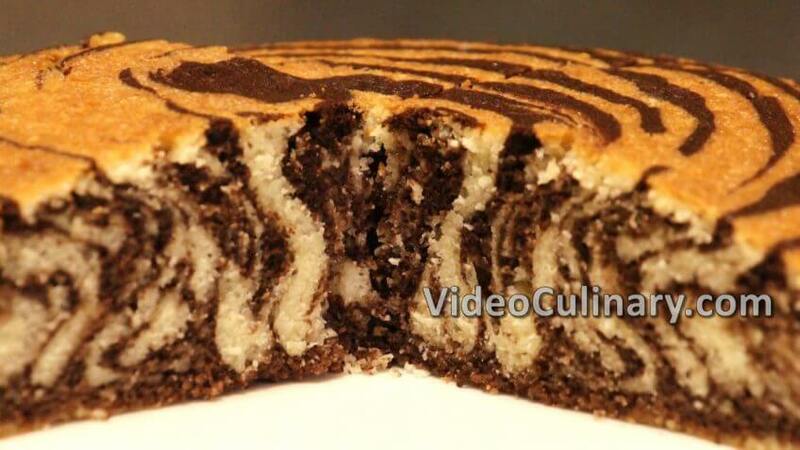 Cut through the baklava and serve with tea or coffee. 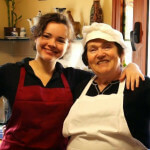 Please visit our website for baklava rolls recipe, and other delicious, easy to follow recipes!